This was my second trip to the Four-C trail. Starting at Ratcliff lake you may encounter a few people (boy scouts probably) but few people seem to venture further out onto the Four-C. There are some minor elevation changes but they aren't much of a challenge and they don't last long. Bridges are fairly common and well maintained. On my first trip I found myself within twenty feet of a deer. This time we found a turtle and snake and a lot of jumping fish and frogs in the pond about 3 miles in. There's no potable water and not much worth filtering so pack in what you think you'll need. Hiked this trail out and back over the course of 3 days. A standard forest hike, nothing exciting. Lots of scouts on the trail (spring break)Would have been better if the end at Neches overlook had actually had a scenic view of the river. 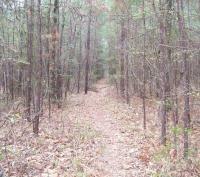 I hiked about 37 miles on the 4C trail on Mar 13-15, 2006. The trail: Well marked. No problem following it in daylight. The northern end is different from the southern end. The northern half has more elevation changes because of the overlook. It seems more open, especially with the almost mile walk along a power line right-of-way below the bluff. Both the north and south ends could be swampy in places when there is rain. Fortunately these places are well bridged. Trying to locate myself precisely based on the trail track on the maps and relating that to the ground was hit and miss for me. Water: There is no potable water on the trail! I thought that I would use my MIOXX purifier to take care of water needs along the trail, but with only a couple of exceptions, I was suspicious of even trying to purify the water that I found. It wasn’t the brown color in the water from the pine tree tannin. The problem was stagnation in this drought season. Mileage markers: I saw mileage markers 1-4 on Monday. I think there were relatively accurately placed. I didn’t see another marker until Tuesday when I was returning from Walnut Creek Camp. This was mile post 8. I think it was too far north. I passed it an hour south of Walnut Creek Camp. That would mean that I’d traveled two miles an hour. I seriously doubt that I did that. On Wednesday I saw mile marker 12 and it was only a couple of hours for me south of the northern trail head. I know it was out of place. That would have meant I’d traveled 7+ miles from the trailhead in about two hours and I only do that in my dreams. I saw the number 13 marker Wednesday night, but I’m not sure where that was. Note: Both Mickey Little’s book and the USFS’ brochure show a primitive camping site at Walnut Creek Camp. There is a shelter and a privy here. Mickey Little’s book shows a primitive camp site at Pond Camp. The USFS’ broacher reports a shelter at Pond Camp. There is no shelter or privy at Pond Camp! The privy at Walnut Creek Camp was in sad shape. Hunters had blasted holes in the commode itself and the privy area was not much better than a trash dump. The shelter was in good shape. There were 5-6 level tent sites around the shelter. Pond Camp was just an open area frequented by hunters with the usual amount of trash that they leave. The northern trailhead is primitive. There are no improvements. There is space to camp, but I recommend protecting your campsite by placing your vehicle between your tent and the natural path for vehicles to follow. A couple of good ol’ boys were screaming down the forest roads in their pickup trucks as I was thinking about setting up camp at the northern trail head. I decided that with those kinds of folks in the area, I’d camp at the rec area and just park my car at the northern trailhead. 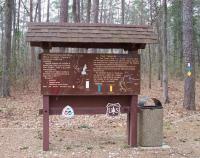 There is secure trailhead parking at the Ratcliff Rec Area for $3.00/night. It was a nearly perfect day to hike this trail. Much of the day was a bit overcast, and the temperatures were in the 70s. My wife and I had never hiked the Four C Trail before. Our plan was to park at the trailhead at Ratcliff Lake National Recreation Area and hike up the trail for 5 miles and then return by the same path. As we left the trailhead, we were impressed with the amount of work that had gone into building this section of the trail. However, we were glad when the Four C trail split off and left the gravel bed behind. The first 1.5 miles of the trail wind through the northern part of the Recreation Area. There is little undergrowth here. The Tall Pines Trail shares the path with the Four C trail for much of the distance until it finally veers off and heads south back into the campground. The Four C trail then heads north and crosses Forest Service Road 521. The area between the Forest Service Road and FM 227 had witnessed a prescribed burn only 4 days before, and scattered pillars of smoke still rose from the forest floor. The area north of the FM 227 is much more dense than that on the southern side. The first mile or so of the trail north of the highway follows along an old tramway bed, a survivor of the old logging days of the CCCC. At about the 4 mile mark, we crossed a little logging road that teenagers still use for parties, as evidenced by the pile of beer cans. I like this trail and would like to hike its entirety. There are mile markers located at each mile, but unless you are looking for them, they are easy to miss. Instead of lining the trail, they are usually set off the trail 10 to 20 feet, and they are set perpendicular to the trail. Luckily, I had turned backwards to check on my wife at exactly the first mile marker and I spotted the marker by chance; otherwise, I would have missed it. The bridges are in excellent shape, and the trails are well marked with white blazes. The Trail Tamers Trail uses yellow blazes while the Tall Pines Trail uses blue blazes. We took lots of pictures, and I’ve posted some here. Beautiful, well marked trail. We parked at the overlook and hiked to Pond Camp. Hunters trashed out the area, so we made our own camp not far away. We didn't see anyone else all day Saturday and only one other group of hikers on Sunday. 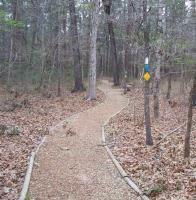 The trail was covered in leaves and views were as good as it gets for the piney woods of East Texas. Ticks are still a problem and one must check often to ensure they don't become a problem.